Now open for 6 years, the refurbished Mulberry restaurant is celebrating increasing success. 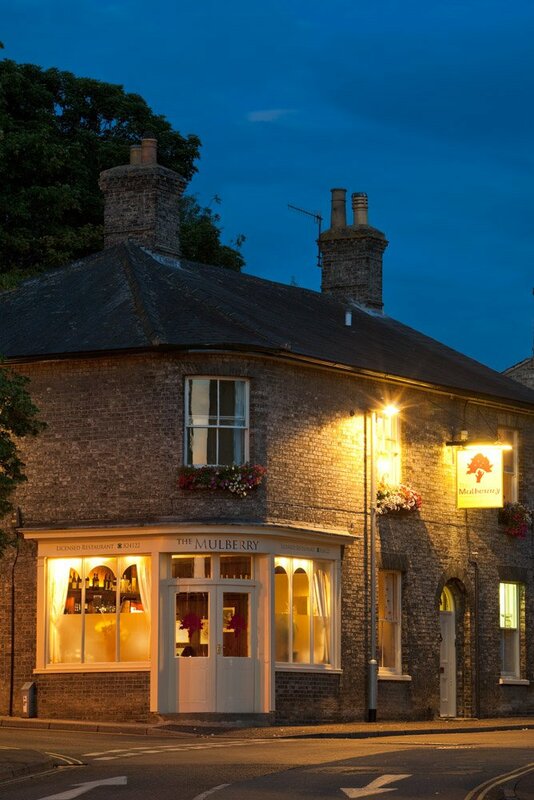 An intimate yet welcoming atmosphere greats you from the moment you enter the gorgeous curved doors with menus adapted to suit the ever increasing number of clients who have discovered this little gem of a restaurant in the heart of Thetford. Situated just a few paces from several of the free car parks, on the corner of Cage Lane & Raymond Street, the Mulberry is a discreet, relaxed & friendly oasis with a walled garden. It offers high quality Mediterranean & English style food using mostly locally sourced produce. Only the best will do, and this is proved by the fine flavours & taste sensations which end up on the plate: nothing pretentious, just simple cooked food prepared from the finest ingredients using traditional methods. Chef produces his own stocks & sauces, butchers his own meat to find the choicest cuts & prepares all the sea-fresh fish & shellfish. Karen says, “Our growing client list of local, and not so, local customers, are full of praise for our food – you only have to look at our online reviews." The restaurant is open for bookings from 6pm Tuesday to Saturday, special lunches catering for 12 or more people can be pre-booked to suit the special requirements of business, family or any celebratory occasions.